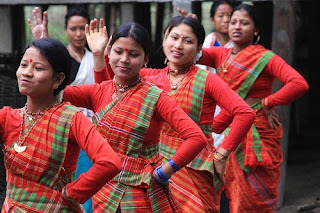 A wave of renaissance is touching the hearts & minds of Mishing ( Miri ) Tani tribe inhabiting the states of Assam & Arunachal Pradesh. Since time immemorial Mishings have been striving towards better survival & replenishing for greater acquaintances with the other cultures of the world. The Mishings are in truest conviction, the descent of Donyi Polo which is also their religious faith & identity which can be traced from Abotani, which in turn confirms affinity with the other Tani people. 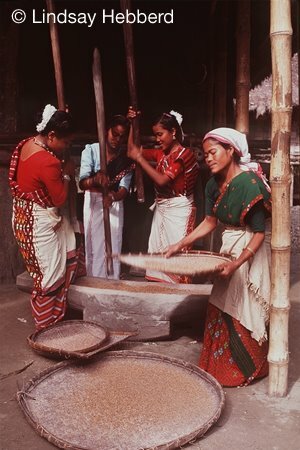 The Tani people are variedly known as Mishing ( Miri ),Adi,Galo,Nyishi,Mishmi,Apatani & Tagin. The tales & traits of origin, language,culture,tradition & other social aspects of all Tani people have similar root. The Mishings too like other Tani people had their abode in the upper course of Yangtze - Kiang & the Hwang - Ho river valleys of China. The Tani people have since time immemorial contributed to evolution of a vibrant culture now flourishing in the regions they inhabit. The Mishing as well the Tani language as a whole falls into the Tibeto – Burmese branch of SinoTibetan ethnologue family. The Mishings inhabit the riparian tracts along the river banks of Subansiri, Siang, Dihing, Dibang, Dhansiri, Jia Bharali & fertile plains of Brahmaputra valley of Upper Assam. At present the Mishings are under surge of reawakening not necessarily mere ethnic-centrist but its in tune with the global perspective where cultural separatism, ethnicity & identity consciousness are expressed with pride! The pathway to Mishing neo-renaissance is nothing but its a comprehensive & collective effort by a few Mishing Tani's keeping in mind the context of global crossroads where hundreds of minor ethnic groups identity,language,culture & other significant traits are in recurrent threat of extinction & imminent danger of being lost forever. This Blog ( Mishing Renaissance ) is an attempt keeping in view of this global transitional upsurge the Mishing tribe which is one of the prime constituent of Greater Tani identity wish to express themselves at the global level. http://mishingrenaissance.blogspot.com/ fulfills the long standing desire/demand of Mishing Tanis for expression in this global village. Mishing Renaissance in its broadest sense covers the identity, language,culture and other socio-cultural development trends and challenges faced by the Mishing people. Today's Mishing youth stand for qualitative ( and quantitative ) uplift of our people and in turn also wish the closer integration with our Tani brothers of Arunachal Pradesh. Mishing Renaissance holds plausible the spirit of Tani nationality and wish it exerts itself in a more bold manner in the coming years.